Orthokeratology, is a safe, reversible and effective vision correction solution.1,2 However, incorrect care of contact lenses and solutions can increase the risk for eye infections and corneal ulcers. Risk factors for acquiring an eye infection include improper lens cleaning and disinfection, poor hygiene practices and smoking. Following your practitioner’s hygiene regime, along with regular reviews, will minimise this risk. To avoid confusion make a habit of inserting the same lens - generally the right lens - first. You will notice that the right lens is green and the left lens blue. Minimise the risk of lens loss by plugging the sink or using a paper towel over the drainage opening. Step 2. Place 1-2 drops of lubricating insertion eye drops into the back of the lens. Place the lens on your index finger and insert directly into the centre (coloured part) of your eye in a face down position. To save confusion, it’s a good idea to insert the right lens first. Step 4. Dry and wipe out your lens case with a tissue. Leave the case lid off to air dry while wearing your lenses. On rare occasions, a lens may become dislodged from the centre of the eye and move to the side. This may be uncomfortable but won’t do any harm. Look in a mirror to establish where the lens has moved to. Move your eyes in a direction away from where the lens is located. For example, if the lens is on the white of your eye nearest to your nose, look towards your ear. Gently nudge the lens back to the centre of your eye using your eyelids. Avoid directly pushing the lens with your fingers as this can damage the surface of your eye. Alternatively, remove the lens using your suction tool and reinsert correctly. If on insertion you experience stinging, burning or pain, remove the lens, rinse and re-insert. If problems persist, remove the lens and see your optometrist at your earliest convenience. Method 1 – Manual removal. Using your middle fingers, open the lids wider than the lens diameter. Apply pressure to the lid margins, pushing in together to move your lids under the lens and lever it out of the eye. Method 2 – Suction tool removal. Using your middle fingers, open the eyelids wider than the lens diameter. With the suction tool between your index finger and thumb, align the suction cup so it is positioned in front of and parallel to the lens. When the suction cup touches the lens, apply gentle pressure to adhere the lens to the cup and remove the lens from your eye. After removal from the eye, carefully slide the lens sideways from the suction cup and it will come off easily. Always clean your lenses after wear. An effective cleaning process is vital to ensure comfortable, hygienic and infection-free contact lens wear. With correct cleaning, contact lenses will feel better on your eyes, allow better eye health and vision, and dramatically reduce bacteria and other contaminants. 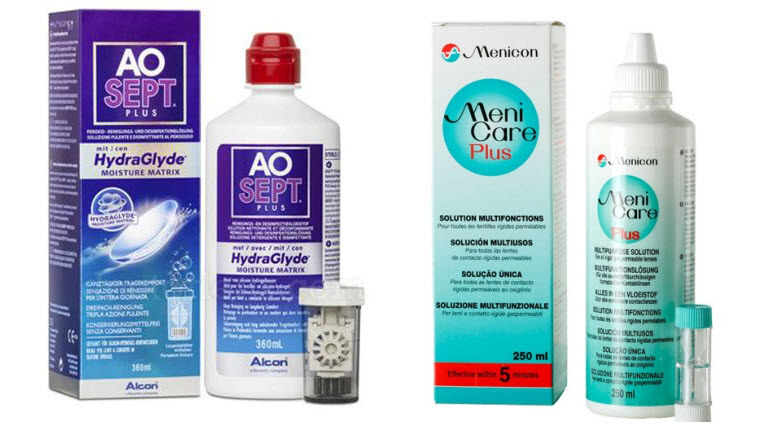 There are several types of ortho-K lens cleaning solutions: Peroxide based systems like AO Sept and multipurpose lens solutions like Menicare and Boston Simplus. There are several steps involved in cleaning and storing Ortho-K lenses that vary depending on the system. These solutions work by having your contact lenses immersed and sterilised in 3% hydrogen peroxide. Over the course of a 6 hour period the catalyst in the case converts the hydrogen peroxide into water and oxygen gas. This cleaning solution has the advantage that when your lenses are removed from the case they require no rinsing as they are covered only in sterile, non-preserved water. They also generally require no rubbing step, which decreases the risk of accidental breakage. The case can be left to air dry when not in use, and should be replaced with each new bottle of solution. AO Sept now had the addition of Hydraglyde, an ingredient which improves the wettability of your contact lenses, making them more useful for scleral patients with long day-wear times. To clean your lenses fill the case up to the line, place your lenses in the correct cage-holder. Then submerge the case and screw closed. Take care when transporting the case as sometimes the small gas-release hole can leak solution. Care should be taken not to get the un-neutralised peroxide in your eyes as this will sting painfully. If this occurs rinse thoroughly with water and contact your optometrist if the pain persists or your vision is affected. Find AoSept at our shop here. To clean: Place a few drops of multipurpose contact lens solution on the palm and the lens, then rub with your finger-pad for at least 10 seconds on each side.10 The back surface (concave) is best cleaned by moving your thumb across the surface. This step removes material that deposits on the lens during wear. Whilst Ortho-K lenses are strong, with incorrect technique or too much force they can break. To disinfect and condition: Place the lens in fresh solution in your lens case, ensuring the lens is completely submerged. This step kills microbes on your lenses and prepares the surface of your lens to stay wet throughout wear, increasing comfort. Store your lenses in this solution for at least 4 hours for the cleaning process to be complete. NEVER rinse or store your lenses in tap water, as micro-organisms are plentiful and can cause infections in your eyes. 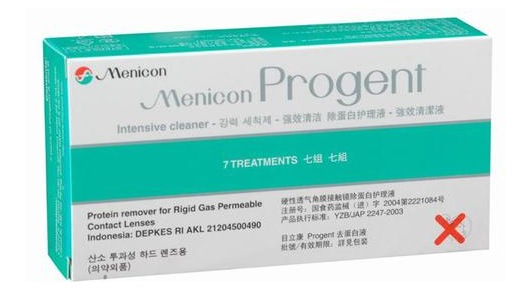 To clean and maintain the wettability of your lenses use intensive cleaner, such as Menicon Progent. Place the lenses into the contact lens case holders. Open vial A and B by twisting the cap and pour the contents into the contact lens case. Replace the lid and tighten. 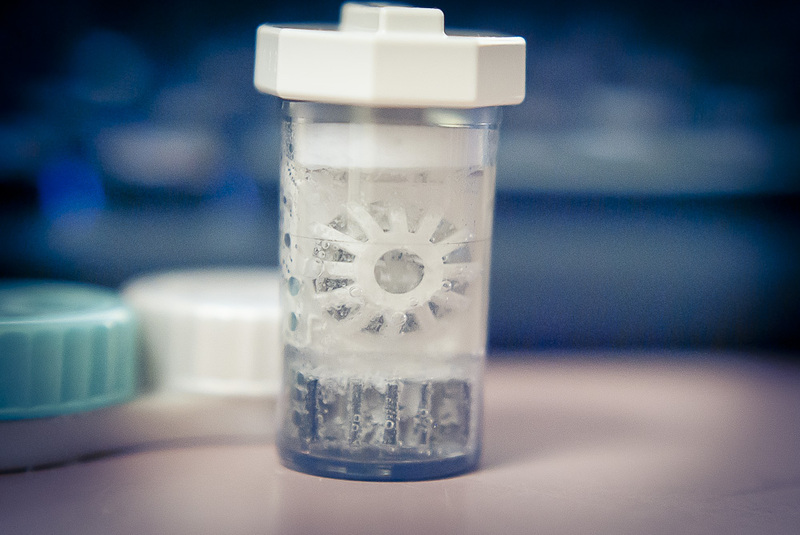 Leave the lenses in the solution for 30 minutes, then remove and rinse thoroughly with saline. Lenses can now be worn or soaked in your daily cleaner. (please note that this product may not be available in all countries, ask your practitioner). You should not experience any discomfort from the lens while you are sleeping; however, it is not usual to experience some discomfort with your eyes open as you get used to Ortho-K lens wear. This generally improves with time. When you wake up, insert a drop of preservative free artificial tear solution into the eye to increase moisture and assist in the lens movement on the eye. If the lens is bound it will not move - this means it may be necessary to manually loosen the lens. Upon removal of the Ortho-k lens you should notice some improvement in your unaided vision. This improved vision will last most of the day. After approximately two weeks vision should be stable all day for most forms of orthokeratology vision correction. Follow-up appointments are vital to the monitoring and success of your new Ortho-K procedure. The first follow up appointment will be scheduled for the day after your first night of wear. The other follow up appointments will be determined by your Ortho-K practitioner based on your response to the first night of orthokeratology therapy and the severity of your vision correction. Foreign body sensation and slight discomfort while wearing the lenses. Mild dryness and slight crusting in the corners of your eyes on waking. Blurred vision during the first week of Ortho-K lens wear. Take note of the changes in your vision and to report to your optometrist. Glare and halos at night especially during the first few months of Ortho-K lens wear. The process where this clears up is called neuroadaptation. In some cases as with myopia control, some glare can persist. However, due to the lifestyle of younger patients, these rarely bother them. Pain, light sensitivity, burning, stinging, and excessive watering on lens insertion. Remove the lens, rinse with preservative-free saline and re-insert if this occurs. A persistent redness, pain or light sensitivity of the eyes which doesn’t resolve after lens removal. Feeling like the lens is suctioned onto the eye and experiencing difficulty removing the lens in the morning. Pressure on the lens. If the lens lands on a mirror or flat surface. Gently slide it off to the edge of the surface or use a suction tool to remove it from the surface. Pulling the lens too firmly from the suction tool. Slide the lens off the suction point instead. Forcing the lens to bend excessively while cleaning. 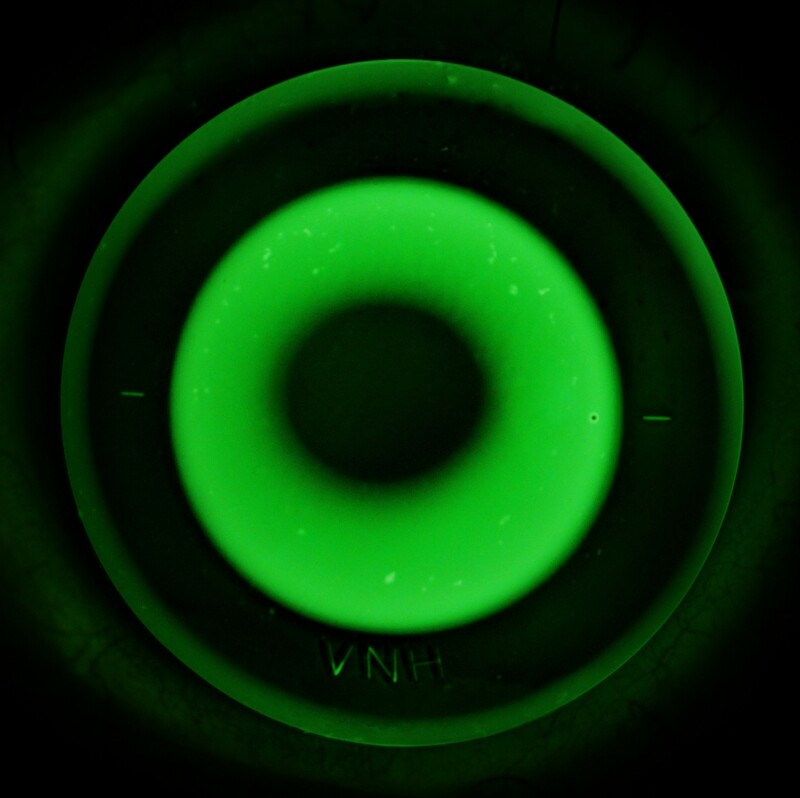 Some friction force is required to clean an ortho-K lens using your cleaning solution, but not too much. The resistance from your skin surface will be sufficient to clean the lens. If too much force is applied on both sides of a ortho-K lens, the lens will flex and eventually snap. It is very rare for a lens to break in your eye unless something hits your eye or your removal technique is incorrect/very forceful. The solutions you use to clean your lenses will not weaken or degrade them ‒ not even the powerful Progent fortnightly deep cleaner. We understand that when you are learning how to use your lenses you may be inadvertently forceful during insertion, removal or cleaning. Because of this we offer a 1 month manufacturer’s replacement warranty on accidental breakages. Outside of this period, your lens is not covered by a warranty and the lens will need to be replaced at your cost if damaged or lost. If you break a lens within 18 months of its original purchase/fit then we are happy to offer 50% off the price. Outside of this 18 month period the lens will be full-price. Normally a lens will take less than one week to arrive from the lab when ordered. If you are very dependent on the lens, we will of course ask our lens company to manufacture it as soon as possible. Because of the inevitable waiting time, we encourage all ortho-K lens wearers to have a spare set of lenses available for a situation where a lens is lost or broken. We also offer 50% off the full price for a spare lens if purchased within 12 months of the original. If you do lose or damage a lens, please don’t fret, just give our friendly team a call and we will arrange a replacement as quickly as we can. Do not modify the recommended cleaning routine or solutions without consulting your optometrist. Other solutions may not be compatible with your eyes and lenses, and may cause discomfort or allergic reactions. Shortcuts with cleaning solutions may appear to save money but can result in ineffective lens cleaning and disinfection. Incorrect cleaning solutions may damage your lenses or lead to an eye infection which can result in vision loss. Never clean or store your ortho-K lens with soft contact lens solutions. These products work in a different way to the ortho-K lens solutions and will not clean and condition your ortho-K lenses. Replace the contact lens case every time you start a new bottle of lens cleaner to avoid microbial contamination. To avoid contamination do not touch the tips of solution bottles. Replace caps after use. If your eyes are very painful after hours, consult your local hospital or emergency eye clinic. If you notice scratches and chips or misplace a lens, contact your optometrist for a replacement. The Safety of Orthokeratology–A Systematic Review. 2016 Jan;42(1):35–42. Efficacy, Safety and Acceptability of Orthokeratology on Slowing Axial Elongation in Myopic Children by Meta-Analysis. 2016 May;41(5):600–8. Choo JD, Holden BA, Papas EB, Willcox MDP. Adhesion of Pseudomonas aeruginosa to orthokeratology and alignment lenses. Optom Vis Sci. 2009 Feb;86(2):93–7. Bullimore MA, Sinnott LT, Jones-Jordan LA. The risk of microbial keratitis with overnight corneal reshaping lenses. Optom Vis Sci. 2013 Sep;90(9):937–44. Sweeney, D., Holden, B., Evans, K., Ng, V. and Cho, P. (2009), Best practice contact lens care: A review of the Asia Pacific Contact Lens Care Summit. Clinical and Experimental Optometry, 92: 78–89. doi:10.1111/j.1444-0938.2009.00353.